This months date was a little funny. It was a Redbox Movie Night. The reason it was funny is because Vadim decided to pick up a Redbox movie for after last months date, which was a few days before opening this months date. So we got to watch 2 movies for 2 weekends in a row! Then, when I went to write about it 2 days later, I realized I forgot to take pictures! So we rented another movie for the next weekend! The only picture I took this time, was of the movie box. 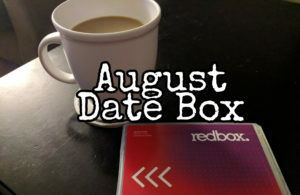 I really love how easy it is to rent from Redbox! And it’s cheaper than reading a movie digitally. I hope my list of dates has been helpful to you so far. 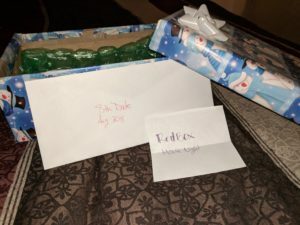 Maybe you can put together a box for a Christmas gift too! I think it’s one of the best gifts I’ve given, so far. Now… I actually remember what next months date is! He’ll be opening it tonight and I’m really excited about this one.